Anne Taintor's products deliver loads of laughs without breaking the bank. Chances are, you know them well: those wry, impeccably groomed women from the 1930s, 40s and 50s who grace Anne Taintor’s unique line of greeting cards, magnets, sticky notes, eco-friendly totes, and dozens of other stylish, affordable products. And in 2011, taintor…with a twist introduced a new generation of smart, impertinent ladies who have stepped out of the kitchen into the bold and glamorous world of the 60s. Anne Taintor’s products are smart, stylish and deliver loads of laughs without breaking the bank. They make entertaining, useful, and very affordable presents for moms, sisters, co-workers and girlfriends. In addition to products from Anne Taintor’s Classic collection, items from the new taintor…with a twist collection will add even more fun to this year’s holiday gift giving. New taintor…with a twist Luggage tags ($9.49) and Anne Taintor Magnetic postcards ($4.49) are affordable and practical gifts for your favorite jet setter. 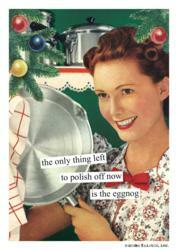 Anne Taintor’s Classic Boxed Holiday Cards ($24.99) are always a hit. Travel-size Emery boards ($4.99) are guaranteed to be stocking stuffer favorites. The Cosmetic bags ($16.99) are perfect gifts for girlfriends. Strong, versatile, playful, and lovely…in a word: feminine. Anne Taintor Coasters ($5.99) make great hostess gifts. Anne Taintor, Inc. is the original vintage humor company. The company’s signature style—wry text juxtaposed against images of idealized women from the 1930s, 40s, 50s, and 60s—appears on magnets, sticky notes, eco-friendly totes, and dozens of other products that have been making smart people smile since 1985. To learn more, visit http://www.annetaintor.com. For more information or to schedule an interview with Anne Taintor, please contact Clare Hertel at 505-474-6783 or at Clare(at)clarehertelcommunications(dot)com.